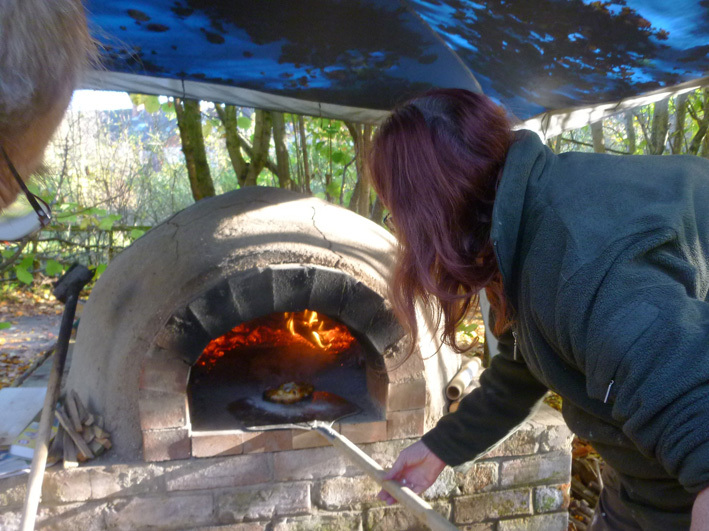 On Saturday 7th November, Pearson Park Wildlife Garden hosted the official launch of their new cob oven. It had been started way back in 2014 and taken several long hard sessions (see 31st May & 11th July) to reach completion, the launch had been eagerly awaited. 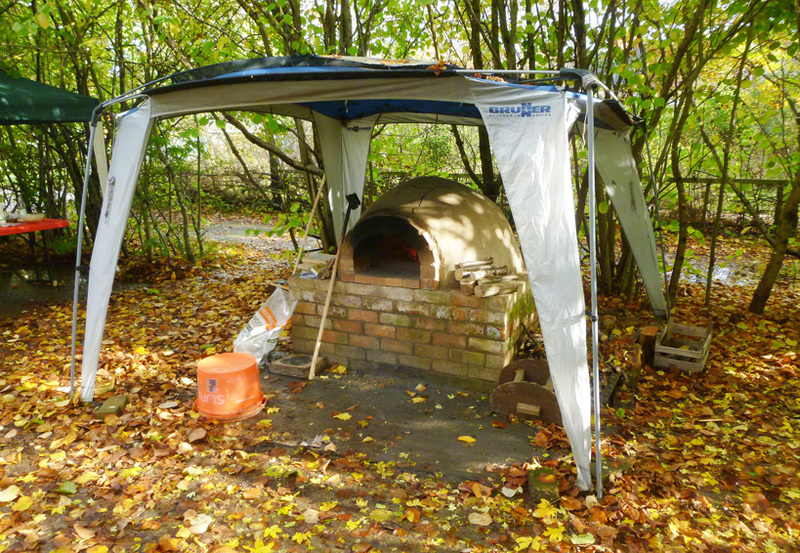 The team had been sure to let the oven dry out properly over several months before removing the sand dome from within. (click on photos to enlarge). 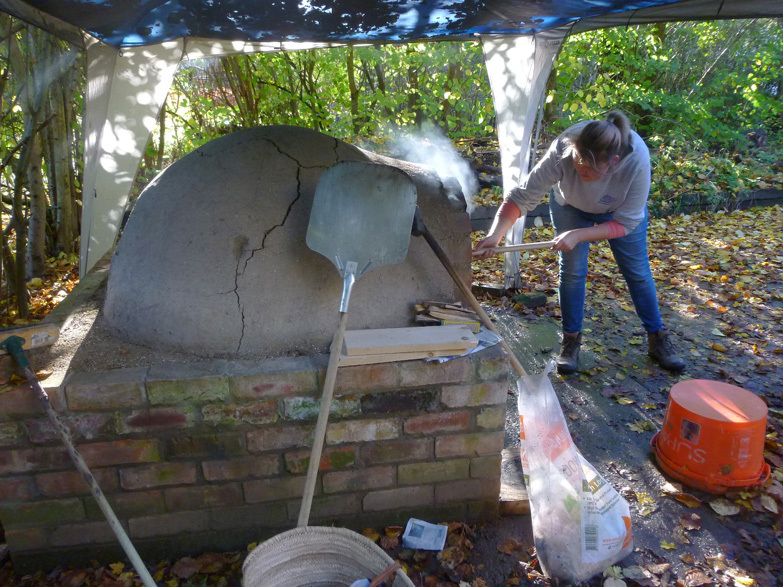 Community Officer Harriet Linfoot had already fired it up several times in the preceding weeks, so knew the ins and out of the oven. She had spent some time getting it ready during the morning’s wet conditions. 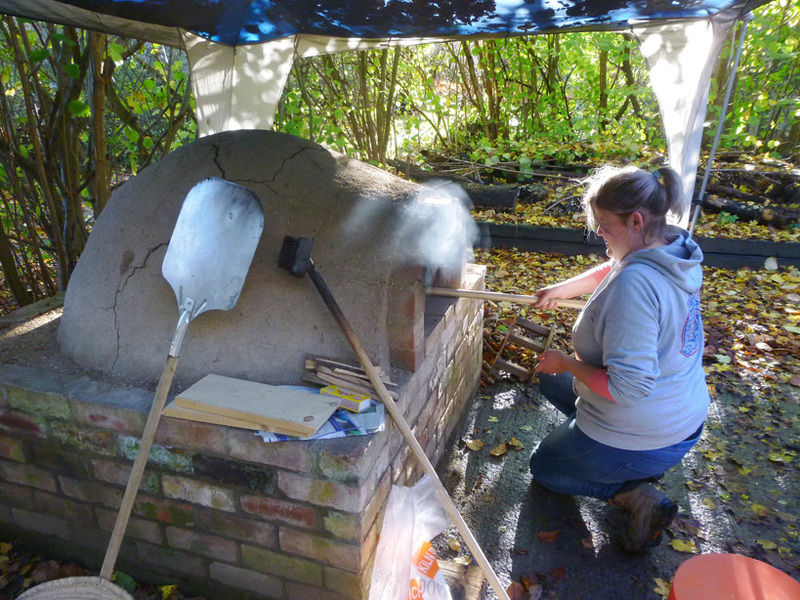 Morning rain gave way to a bright and breezy afternoon and by the time most people began arriving at 12:30, Harriet had got it up to temperature and ready for baking. She had also brought some home-made dough, as had event organiser Lausanne, along with a selection of toppings for people to try. The hot embers in the oven were then pushed aside to make way for baking. Harriet then gave us a brief demonstration of how to roll out the dough and decorate the pizza bases, advising us not to over-do it with toppings. She then took her unbaked pizza over to the oven on a peel for baking, semolina being put under it to make sure it didn’t stick. Baking took no longer than 5 minutes, including a turn half way through to ensure of an even bake. As we stood back with eager anticipation, a sizzling cheese and tomato pizza was taken out to all-round approval. 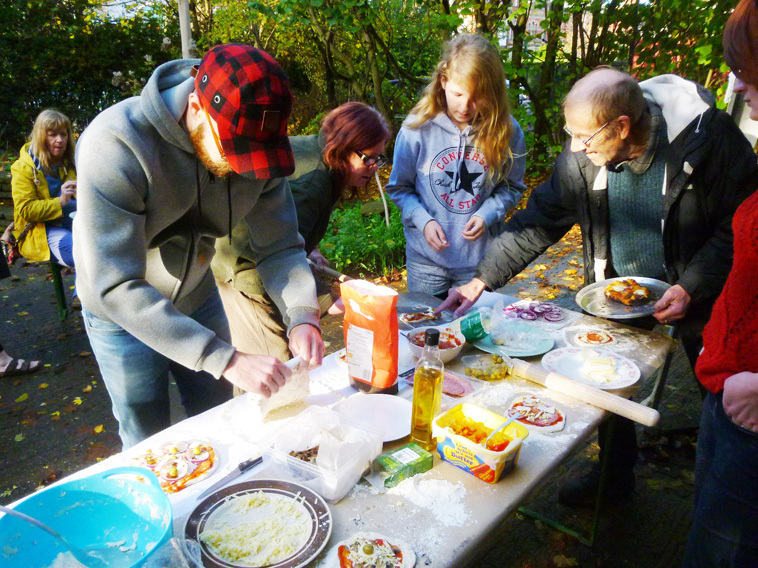 The rest of the group, now ravenous with hunger, then proceeded to roll out and prepare their own pizzas. Event organiser Lausanne made sure everyone had been well catered for before being one of the last to get baking. 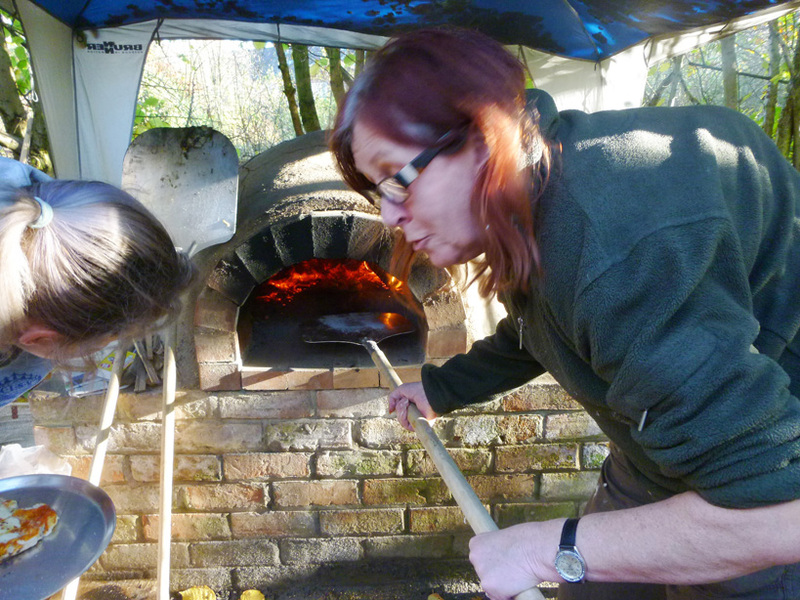 Here she is, sweating over the hot oven – peel in hand baking her pizza, Harriet offering advice. 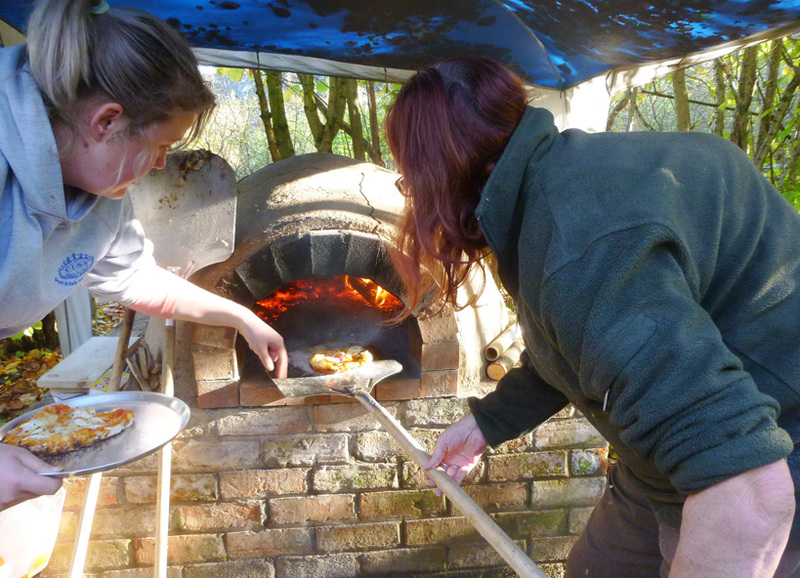 Everyone enjoyed their hot lunch in the open air, and it was clean plates all round – not a morsel left! 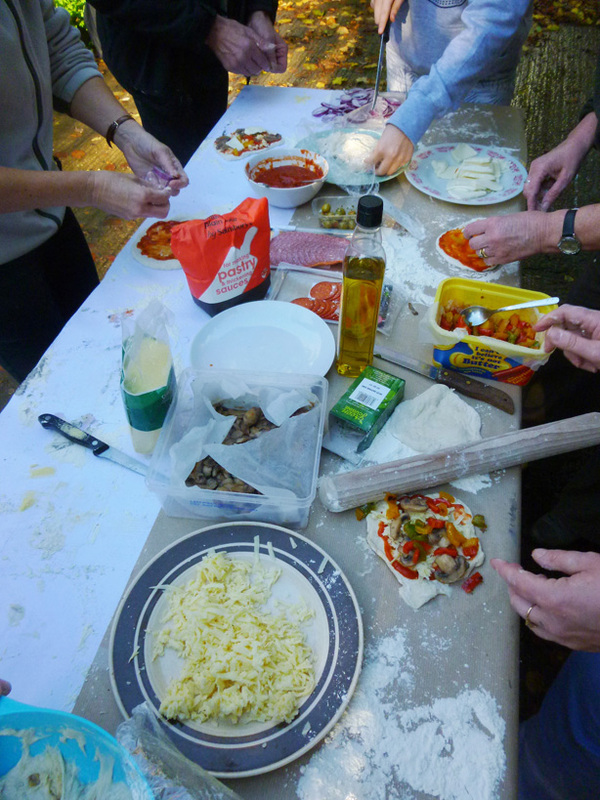 However some pizzas had turned out a little better than others, with one or two toppings being lost to the flames, several pizzas turning out slightly charred and others being served up with a side-portion of ash… but that only added to the fun! 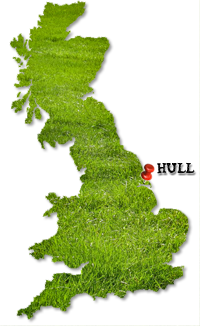 The event was a great success and everyone who attended went home well fed. 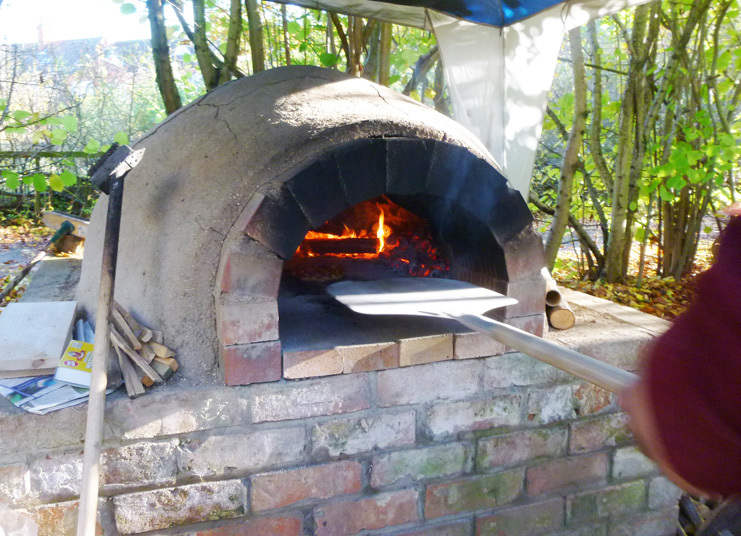 Thanks to everyone who participated in the construction of the oven and came along for the meal.